Directly downloaded from Author's site . . 100% clean untouched file. Package included project files for Android & iOS. 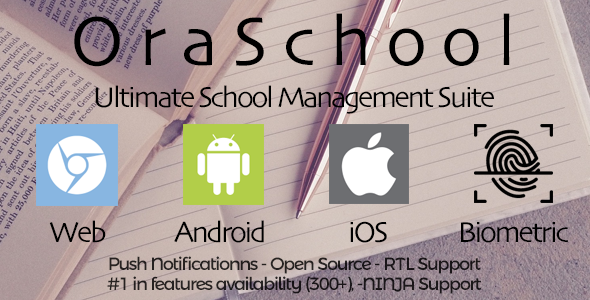 For those looking for Ora School Suite Android Application / Schoex Android Application fr school,college projects etc or having any other issue with this Web Application just pm me. New version released few days ago, been out of system , uploading soon . . .
Schoex Android App Script . . .
excuse me bro but where is the license it is not nulled?? It's not nulled yet . . I don't know if it this nulling process works or not (read it somewhere very earlier): first you need to install it on local server like xampp, while installing it will not ask for license, then after activating move the files to online server & execute. Personally I'll be able to solve your issue from tomorrow (4th sept) , currently out of my home system. i was intalled it on xampp it ask the same thing for license! !